When people think about California they do not think about mysteries. California brings different thoughts: sun, ocean, surfing, Hollywood but nobody is immediately thinking of mystery when they hear the word California. This does not mean that there is nothing mysterious about California. Alabama Hills is one place where mystery and Hollywood converge. Make sure you have your camera with you. You will be taking lots of pictures. Wear some comfortable shoes so that you can do some walking and climbing. Think hiking shoes. Flip-flops are a no no…’cause you might actually get to see some snakes ! If you’re into old Western movies you will find this self-guided tour fascinating. Click here to get the PDF. It’s really interesting how Hollywood is attracted to strange and mysterious places. Oh well…I guess we like mysterious movies, so we get what we like…of course Hollywood has figured that one out. Alabama Hills is indeed a unique place that is perfectly suitable for mysterious movies. No wonder that it has been the site of many old Western Movies. At least a dozen Western classic movies have been filmed here at least partially. Scenes from newer movies like Tremors and Gladiator have also been filmed here. 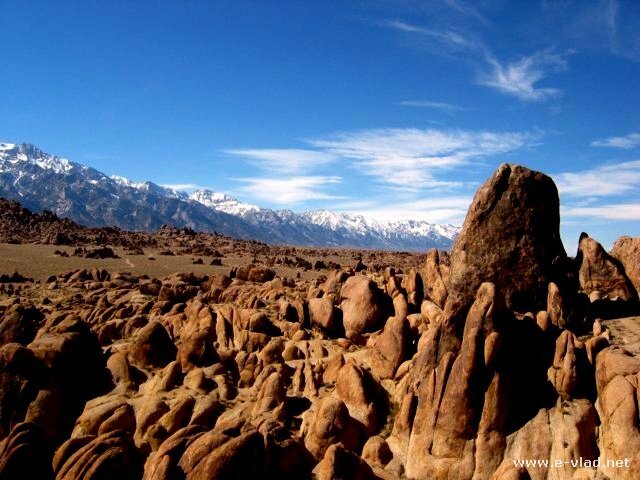 Checkout a list with movies filmed at Alabama Hills. Alabama Hills, California is definitely a strange place. Mount Whitney is truly awesome as seen from Alabama Hills, California. Mount Whitney is the tallest mountain in the continental USA and it dominates the Alabama Hills area. You can’t get away from it and you probably don’t want to get away from looking at it, especially in contrast to the strange rock formations at Alabama Hills. See more pictures of my trip to the top of Mount Whitney. 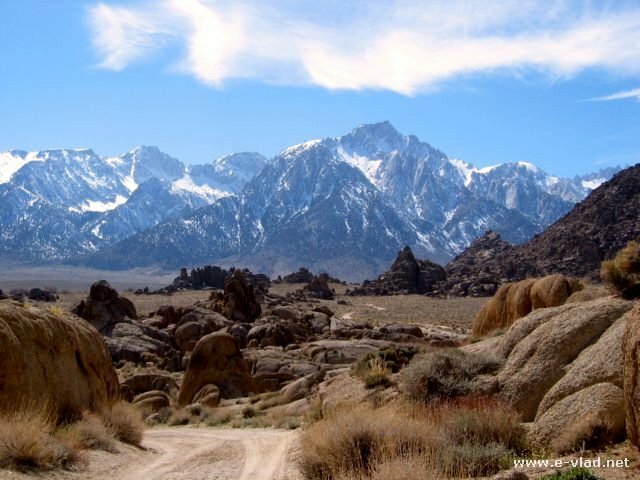 Mount Whitney is a majestic site to behold from Alabama Hills, California. 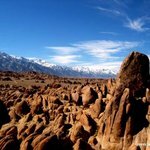 Tips for visiting Alabama Hills, California. Here are my tips and directions for the Alabama Hills Arch trail head. This trail is a short walk with some great views of the area. 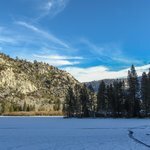 Take Hwy 395 to Lone Pine. This is the road to Mount Whitney. 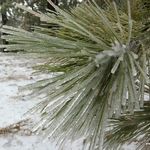 Once you reach Lone Pine turn west (at the stop light) onto Whitney Portal Road, drive 2.5 miles to Movie Road, turn right. After 1.5 miles you will come to a “Y” in the road. Go right and pull into the dirt parking area immediately on your left. You will see the trail sign on the left side of this parking area; this is where you begin your arch walk. If you’re planning a trip to the area you can find budget hotels in the Lone Pine area.